Great cottage for relaxing, but with in walking distance to all the events. This charming cottage is centrally located in the heart of Mt Gretna. It is within walking distance to all the summer events, lake, rails to trails and restaurants. This cottage features a gourmet kitchen, spacious dining area complete with gas fireplace, large living area, 3 bedrooms and 2 full baths. Let's not forget the spectacular porch with a view of the tennis courts and lake. Relax on the porch swing with your morning coffee while planning your day. The kitchen is a chef's dream with new appliances, plenty of work space and open view of the dining area so you don't miss any of the fun. And if grilling is what you want, there is a rear patio equipped with gas grill. The bedrooms offer 2 queen beds and 2 single beds and there are 2 full baths with skylights for plenty of natural light. 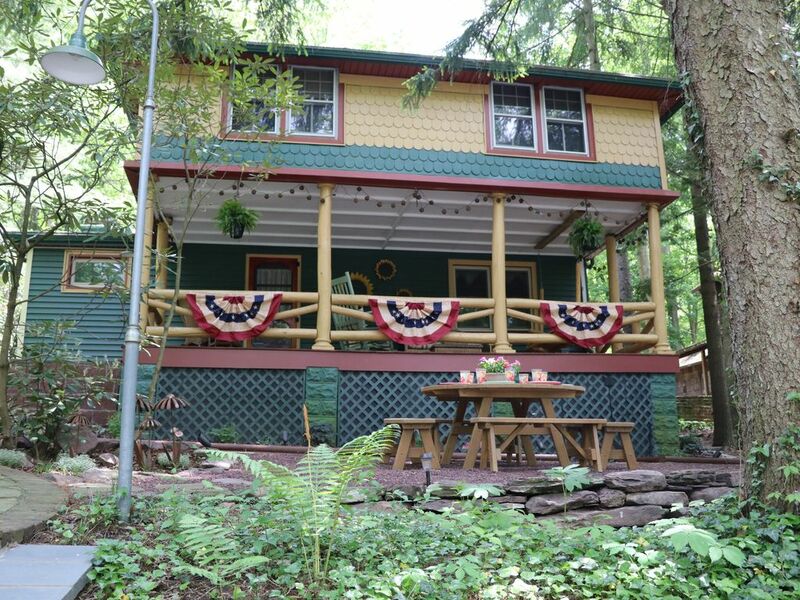 This cottage is complete with central air, WIFI, laundry and off street parking for 2 cars. Close to the tennis courts, beach, walking trails, playground, dining, and summer activities.